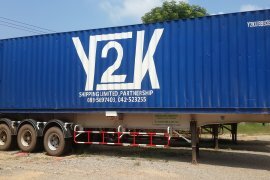 Y2K Shipping Limited, Partnership, We are the big company base in Nakhonphanom province north of Thailand that we offers a fast reliable and cost-efficient container by normal and reefer container cargo for transportation of goods from Thailand to Laos,Vietnam,Chinese and from Laos to Thailand . Copyright © ขนส่งไทย.com 2011. All Rights Reserved.